AAA’s members are paying a steep price for bad road conditions, and those costs are expected to rise even higher in the years ahead. Americans rely on our nation’s roads and bridges every day, and more funding is desperately needed to prevent potholes, other unsafe conditions and longer commutes. Congress increased transportation funding in 2015 to help pay for road repair, but as much as $170 billion in additional funding is needed per year to significantly improve America’s roads and bridges. 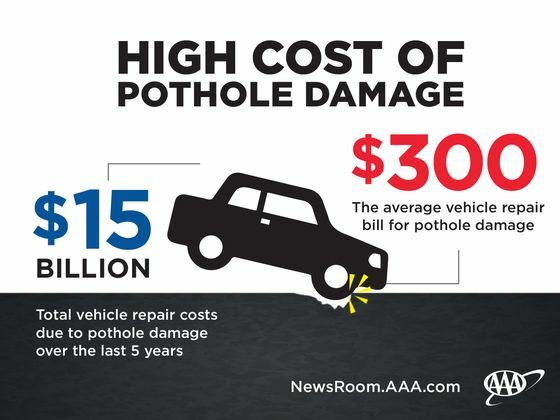 Every year, AAA responds to more than four million calls for flat tire assistance, many the result of damage caused by potholes. In 2015 AAA NNE responded to 60, 521 calls for tire assistance. Spare tires, an important feature missing from one-third of 2015 model year vehicles sold, are critical for drivers affected by pothole damage. Tire inflator kits have replaced the spare tire in millions of vehicles over the last 10 model years and, due to their limited functionality, cannot provide even a temporary fix for pothole damage. AAA has called on automakers to put consumer interests first and halt the elimination of spare tires in new models. Maintain proper air pressure in all tires to provide as much cushion as possible between the pothole and tire rim. Consult the vehicle owner’s manual or the sticker on the driver’s side door jamb, inner glove box, or inside of the fuel filler flap for the tire manufacturer’s correct pressure. Watch for potholes by leaving plenty of space between your vehicle and the one in front of you. Alert drivers have plenty of time to avoid potholes. Before swerving around a pothole, be sure to check surrounding traffic and lanes to determine if it’s safe to move over. Maintain a safe speed for weather conditions. If a pothole can’t be avoided, slow down, if possible. Hitting a pothole at high-speed increases the chance of tire damage as well as harm to wheels, shocks, struts, steering or suspension. High speed also increases chances of losing control of the vehicle, especially if a series of potholes occurs on a curved or uneven roadway. When driving over more than one pothole, reduce vehicle speed and hold the steering wheel firmly to avoid losing control. If possible, don’t brake directly over a pothole. Applying brakes causes the car’s weight to shift to the front of the vehicle and can increase damage from the impact. “Hitting even one severe pothole could alter the alignment of a wheel from suspension damage resulting in uneven tire wear. Uneven and premature tire wear means the tire will need replacement sooner than necessary and can increase fuel consumption at needless expense,” said Moody. “A broken shock or strut from hitting a pothole could alter the steering and handling of a vehicle, and create dangers when driving at higher speeds or in tight corners,” Moody said. Motorists who suspect their vehicle’s suspension components were damaged or broken by a pothole should have their vehicle towed to a high-quality repair facility such as a AAA Approved Auto Repair facility where it can be inspected and serviced, if necessary, AAA NNE recommends. The American Society of Civil Engineers (ASCE) released a report card on the United States infrastructure in 2013. Here is a summary of our local roads. To read the full report, go to Report Card for America’s Infrastructure. New Hampshire - 1,811 of the state’s 16,105 public roads are major roads, and 17% are in poor condition. $430.0 million a year in costs to motorists from driving on roads in need of repair, which is $404 /yr per motorist. Vermont - 1,658 of the state’s 14,291 public roads are major roads, and 14% are in poor condition. Vermont ranks 28th in the nation in state highway performance and cost effectiveness. $201.0 million a year in costs to motorists from driving on roads in need of repair, which is $379 /yr per motorist.